Former Abarth executive Joe Wells and Alfredo Gulla of Alfredo's Foreign Car / Fiat of Larchmont pose with the dealer franchise agreement they signed 45 years ago. That executive was Joe Wells, the franchise was Abarth, and the dealer was Alfredo Gulla of Alfredo's Foreign Car, Larchmont, New York. Recently, the encounter was repeated, only the roles were reversed, this time Joe Wells was buying an Abarth and Alfredo Gulla was doing the selling. These two men contributed to the success of Abarth and Fiat during the company's heydays; Joe Wells, the general manager of Abarth Sales Corp, and Alfredo Gulla, consistently the nation's top Fiat dealer. I had the opportunity to talk to the two men on that day and learn some of the history of Abarth in the US during the mid-1960s. 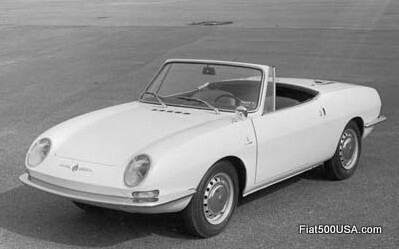 Fiat Abarth OT 1000 Spider. The OT stands for Omologato Turismo. In the 1960s, Abarth was an unstoppable force on the race tracks, with world championships in: 1964, '65, '66, and '67, plus numerous world records for speed and endurance and nearly uncountable record of race victories, over 900 in 1967 alone. 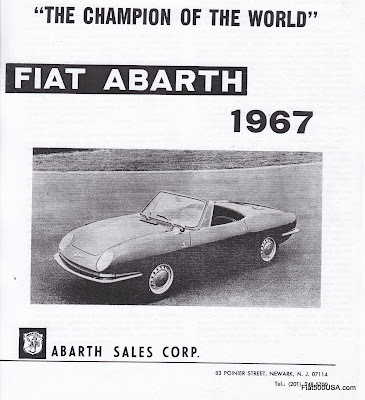 During this time in the mid 1960s, Abarth Sales Corp was the official importer, taking over street car distribution from Roosevelt Automobile Co. (Franklin D. Roosevelt JR's company). Additionally, Abarth racecars were also imported such as the Abarth 1000 Berlina Corsa; however, Al Cosentino of FAZA fame, and it is believed John Rich of Rich Motors, and others, also had deals importing mainly racecars in somewhat smaller numbers. At Abarth Sales Corp, Joe Wells was the man charged with pretty much everything: selling franchises, promoting cars at the auto shows, translating Abarth manuals into English. Wells said "It was a dream job for a young man." The cars ranged from the OT 1000 Coupes and Spiders, OTS and OTR 1000s, Berlina Corsas, OTAS and other special bodied Abarths. Sometimes Joe would travel the country in Abarths demonstrating the car and its performance to dealers. He recounted tales of driving a Fiat Abarth 1000 Corsa, and other full boat race cars not homologated for street use, on a single Dutch registration slip printed on onionskin paper that could easily be erased and a new VIN hastily written in. 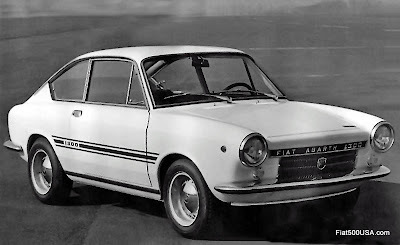 Fiat Abarth 1000 Berlina Corsa. Don't let the humble Fiat 600 origins fool you. These lightweight, purpose built racecars were the product of some of the most renowned racing engineers of all time. The Abarth 1000 Corsa featured the best racing equipment, suspension and brakes; and it was common to see them put a hurting on larger Alfa Romeos and Porsches. Later versions had engines producing 120 SAE HP, weighed in at 1,200 lbs and hit top speeds of 133 MPH. These trips were often eventful. On one of them from the home office in Newark, NJ to the Chicago Auto Show, Joe was halfway through and noticed someone forgot to put plates on the OT 1000 Spider he was driving. Grabbing a piece of cardboard from a Penzoil box, Joe fashioned a license plate up and continued on his way to Chicago and then back home, without ever being questioned! 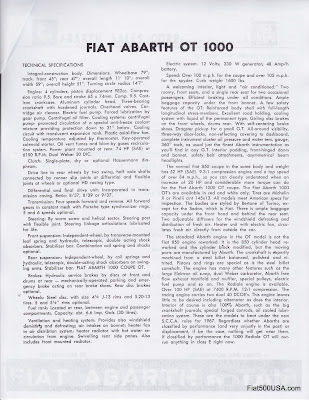 The Fiat Abarth OTR 1000 featured a new hemi head and front mounted radiator among other enhancements. The 982cc engine produced over 100 SAE HP at 7,400 rpm, running 12:1 compression and twin dual throat 40 DCOE Weber carburetors. This is about double the HP the standard Fiat 850 Coupe had. Weight is approximately 1,600 lbs. On another journey, this time to Indianapolis, Joe was driving a red OTR 1000 Coupe and about three quarters of the way through Ohio noticed the Gilmer belt (a special toothed belt used to drive the waterpump and generator) just about to let go. You could imagine finding this special Pirelli made belt would be impossible, and it looked that way to Joe too, however, Joe remembered that Abarth would sometimes use parts from other industries and found the exact Pirelli belt being used for Italian lathes and milling machines at a local supplier! Joe also dealt with Abarth & Co headquarters in Torino, Italy and with Carlo Abarth and Carlo Scagliarina, Abarth's partner. Joe said the factory located at Corsa Marche was spotless, like Enzo Ferrari's factory, the workers wearing uniformed jumpsuits. 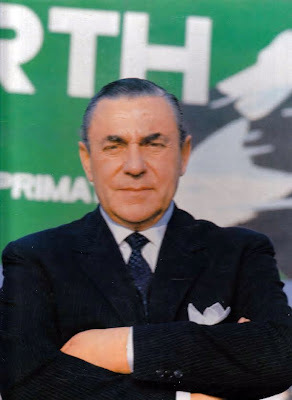 Carlo Abarth was a man with a keen sense of personal style, impeccably dressed with hair slicked back. Abarth was charming when he need be, but also a driven man, who pushed his crew hard. This paid off as Abarth's cars were considered Giant Killers, winning races and setting records with cars that had engines as little as 479cc. Abarth cars were more than just an engine treatment, but were a balanced package with the transmission, brakes and suspension receiving attention from the engineers. These engineers included Gioachino Colombo, Luciano Fochi, Stefano Iacapone and Mario Colucci, all legends that left their mark in the auto industry. 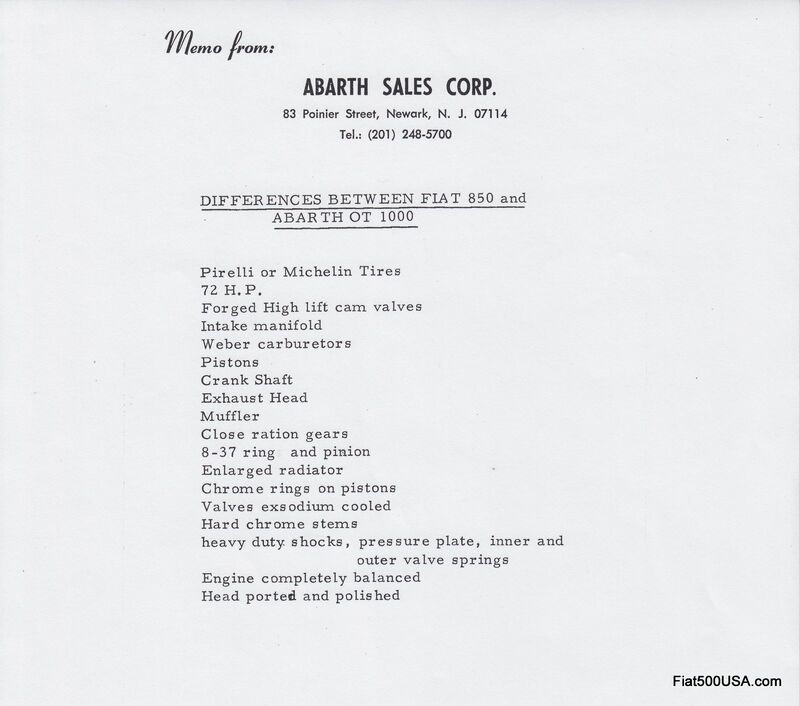 The 1966 Motor Vehicle Safety Act and subsequent 1968 Clean Air Act standards brought Abarth street car importation to an end in the US in 1968. Trying to get a jump on the upcoming standards, Abarth Sales Corp set up engine testing right away and experimented with ways to meet EPA emission standards. An engine test stand was made up and various configurations were tried, including hanging a Toyota Air Pump onto the engine with a common water faucet being used to adjust the air flowing into the exhaust header. Carburetor jetting was critical but the end results were melted manifolds and exploded mufflers. A SPICA fuel injection setup was also tried, but abysmal cold start characteristics killed that idea. 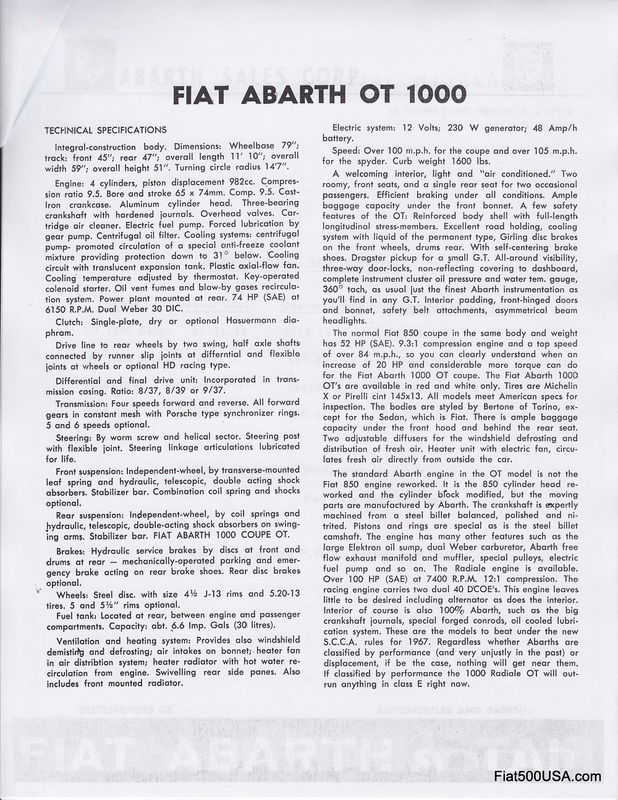 Finally, the 982cc engine of the Abarth OT 1000 was reduced to 817cc, or just under the 50 cu in threshold for emission standards, but was abandoned due to the lack of performance. Joe actually drove an Abarth OT 1000 at the EPA labs for testing. He recalled being there at the same time GM engineers where there, and the strange juxtaposition of the tiny Abarth Sales Corp and huge GM Corp both at the mercy of a disheveled bureaucratic emission tester with mismatched socks. During the 7 mode driving test cycle, Joe related you had to be so careful and not decelerate during shifting as the fuel mixture would go rich, blowing the test. Exhaust gasses were collected and the lab would send the report back in two weeks' time, the results looking like they were crudely hand calculated. The final straw was DOT safety regulations that came into effect in 1968. 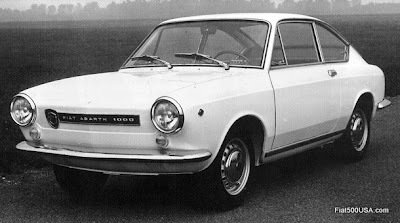 Fiat SpA wouldn't sell US spec Fiat 850 bodyshells to Abarth & Co. 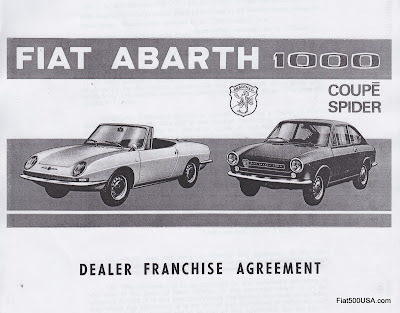 Seems the US Fiat distributor (Fiat Roosevelt Motors) didn't like Abarth Sales Corp selling the Fiat OT 1000 Spider - basically the Fiat 850 Bertone Spider - before the US distributor was able to, and put pressure on Fiat not to sell Abarth the cars. 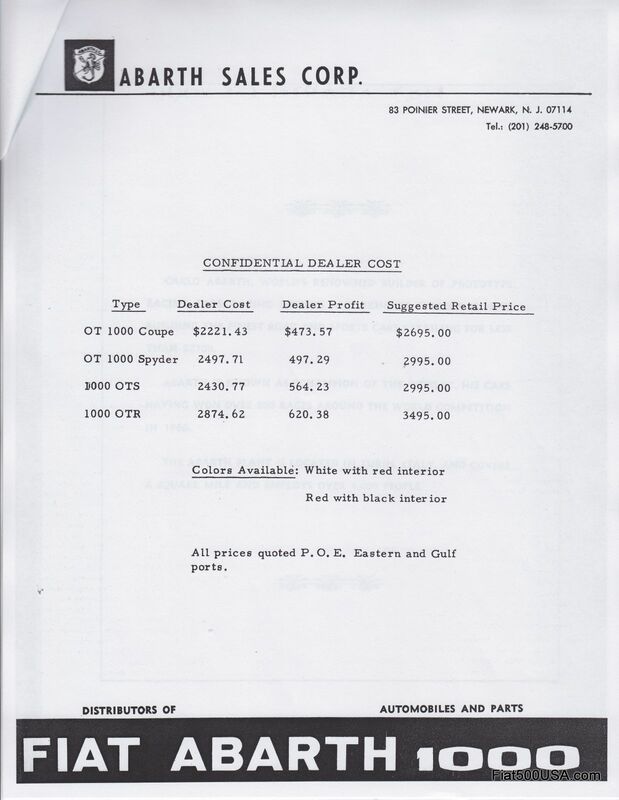 So with no US spec cars and Abarth & Co not interested in meeting US emission standards, Abarth US street car sales ended and Joe Wells moved on to a position at General Motors. 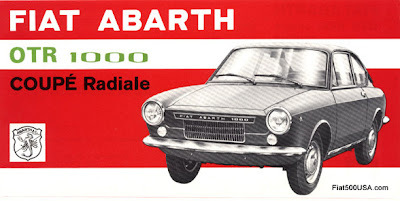 The last Abarth brought into the US by Abarth Sales Corp was an OT 1300. Based on the familiar Fiat 850 Coupe, but with a 1300 cc Fiat 124 motor. Now, forty years later, Joe Wells, the man who sold so many Abarths during the 1960s, is now the one doing the buying. During our conversation, Joe explained why he bought a new Fiat 500 Abarth. As Joe explained it, "I've always liked small cars, that's what drew me to Abarth in the first place. Once you drive in Europe and see the plethora of small cars there you never lose interest in that type of car. My history with the company made me always want to get an Abarth, but at the time I left Abarth Sales Corp I had two small boys and many years of expenses raising them. 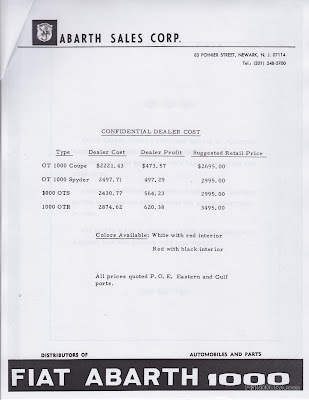 As time went by, and I was in a position to buy a car, I found that the special bodied cars were way too expensive and the coupes and spiders we brought in were nonexistent." Joe went on to say, "Then I read about the 500 in Europe and at almost the same time Fiats purchase of Chrysler. I had earlier thought about trying to bring in a used 500 or 850. When the Prima Edizione arrived I was very close to buying one, but like some decided to wait for an Abarth rather than modify a stock 500. While I considered an older Fiat or kit car, the many benefits of a new car (air bags, crash protection, air, cruise control, and a warranty to name a few) made it a no brainer. You have the fun and uniqueness of an older Abarth with a reliability new car." Asked what he likes about the new Fiat 500 Abarth, Joe commented on how he likes that the car honors the Abarth tradition. "Back then, the cars were a complete package: engine, brakes, suspension and the new cars hold true to the Abarth way of doing things. There are the twin intercoolers, the heavy duty trans, the upgraded suspension and larger brakes. It's not just a bigger engine and a badge and a stripe." Joe Wells, General Manager of Abarth Sales Corp, the US Abarth distributor during the mid-1960s. When the time came, it was natural that Joe would call Alfredo Gulla and come back to Alfredo's Foreign Car/Fiat of Larchmont, the nation's oldest Fiat dealer and the dealer he signed up all those many years ago. I was privileged to spend some time with the two men, and while we enjoyed stories of the past we also talked about the future and look forward to new Fiat Abarth stories. 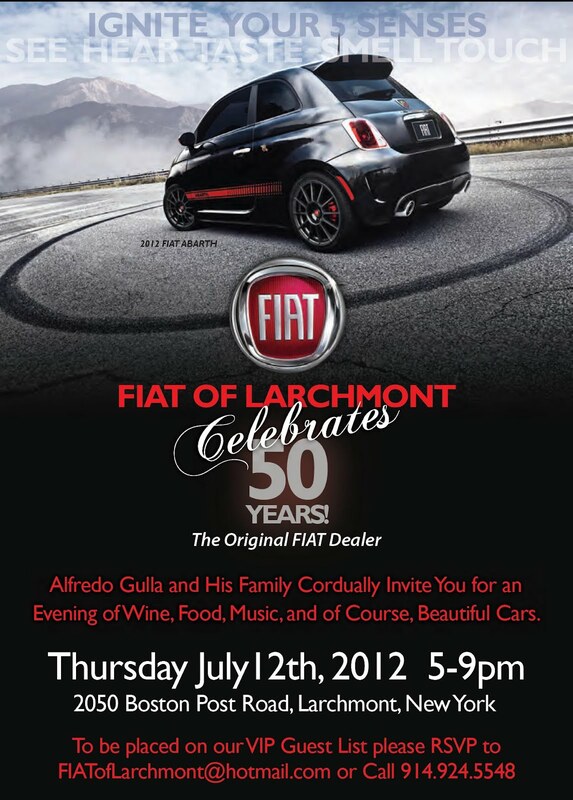 Join Alfredo Gulla, family and friends this Thursday, July 12 as they celebrate Alfredo's 50th anniversary of being a Fiat dealer. The above image shows the invitation and details. Visit Fiat of Larchmont's Facebook page here for the latest news.